Lord Sugar puts ten celebrity candidates through their paces to raise as much money as possible for Comic Relief’s Red Nose Day. 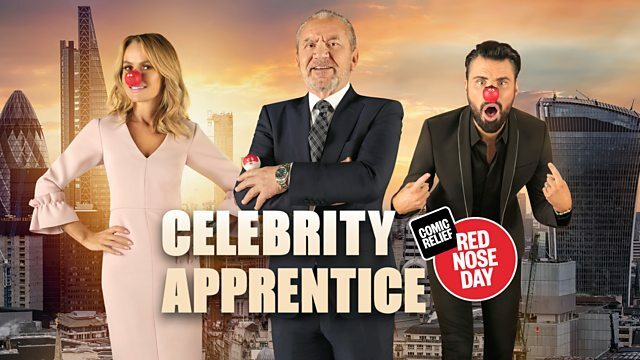 After ten years Celebrity Apprentice for Comic Relief is back! Lord Sugar puts ten celebrity candidates from the worlds of entertainment, sport, journalism and comedy through their paces to raise as much money as possible for Comic Relief’s Red Nose Day. Their task? To organise and host a themed cabaret night in less than 48 hours. They’ll have to call on their contacts, plead with the public, cater and perform. With Lord Sugar expecting them to pull out all the stops, some of the candidates attempt to rope in their famous friends in an effort to get the upper hand and make their event extra-special. As always, both teams will be closely observed by Lord Sugar’s advisors Baroness Brady and Claude Littner. As the deadline approaches will they follow the money all the way to the auction or get caught up in making their party pop?